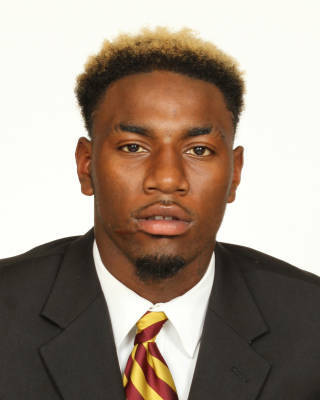 Appeared in all 12 games with 11 starts…made 35 receptions for team-high-tying 744 yards and team-best eight touchdowns…honorable mention All-ACC…earned team’s Offensive MVP award…receiving yards total broke FSU freshman record that had stood for 41 years…tied program’s freshman record with two 100-yard receiving games…touchdowns total was one shy of freshman record and tied for fourth among all ACC receivers in 2018…first Seminole since Peter Warrick in 1998 with two 70-yard touchdown catches in a season…two 70-yard grabs tied for ACC lead and was one behind national leader…became fifth freshman in program history with 70-yard touchdown reception and is one of two with multiple touchdown grabs of at least 70 yards…average of 21.3 yards per reception ranked fifth in NCAA and second among freshmen…averaged touchdown every 4.38 receptions, tied for 10th-best among 72 receivers nationally with at least eight touchdowns…averaged 39.1 yards per touchdown…also contributed on special teams, adding six tackles…recorded career-high 142 yards and career-high-tying two touchdowns on five receptions at North Carolina State…earned ACC Receiver of the Week recognition for his performance at Wolfpack…made three catches for 112 yards and one touchdown, the game-winning 74-yard catch with 1:49 remaining, and two tackles in 22-21 win vs. No. 22 Boston College…earned ACC Receiver of the Week and Rookie of the Week honors for his performance vs. Eagles…recorded two catches for 77 yards, including 78-yard touchdown that was longest scoring catch by FSU freshman since Warrick Dunn in 1993, in 37-19 win vs. Northern Illinois…made collegiate debut with two catches for 39 yards in season opener vs. No. 20 Virginia Tech…scored first two touchdowns on two receptions for 44 yards in 36-26 win vs. Samford…made two receptions for 17 yards at Syracuse…caught three passes for 71 yards and one touchdown in 28-24 victory vs. Louisville…extended touchdowns streak to three straight games with two catches for 37 yards and one score at No. 17 Miami…made 23-yard reception in 38-17 win vs. Wake Forest…caught four passes for 55 yards and recorded first two collegiate tackles vs. No. 2 Clemson…gained 49 yards on six receptions at No. 3 Notre Dame…ended season with 78 yards on three receptions and two solo tackles vs. No. 13 Florida. Tabbed a four-star recruit by ESPN, 247Sports and Scout after starring at Turner County High School…collected three stars from Rivals…rated the No. 21 recruit in Georgia and the No. 32 wide receiver by 247Sports…ranked the No. 36 player in Georgia and No. 43 wide receiver by ESPN…rated the fourth-best wide receiver in Georgia by Scout…named to the Atlanta Journal Constitution Class A public All-State First Team in 2015 and 2016 and First Team All-State by the Associated Press in 2015…also selected Georgia Sports Writers Association All-State Second Team 2015…named In the Game Magazine Turner County Offensive Player of the Year and Region 2-A Player of the Year in 2016…is a big bodied receiver that can outmuscle defenders…ESPN said “he attacks the ball at its highest point and will extend in a crowd”…finished 2016 with 40 receptions for 1,187 yards and 19 touchdowns…helped lead Turner County to an 8-4 record and its first playoff win since 2008…committed to Florida State in January 2017…high school teammate of fellow 2017 signee Ontaria Wilson…chose the Seminoles over offers from Florida, Georgia, Auburn and Ole Miss among others.